Working Americans are getting left behind. While corporations have reaped the benefits of economic recovery, taken advantage of the Tax Cuts and Jobs Act, been pocketing record profits, and making trillions of stock buybacks, the American worker is in a state of crisis. Wages have stagnated since the 1970s with any gains mainly going to the highest-paid workers. The federal minimum wage ($7.25 an hour) has not budged in a decade. These realities threaten the financial stability of millions and mean that the purchasing power of most workers today is the same as it was in 1978. The concept of a minimum wage establishes a floor of compensation below which workers cannot hope to support themselves: our floor has been set at $7.25/hour since 2009. That federal minimum wage has not increased with inflation, either, so it loses value over time. Over those 10 years, it has become increasingly difficult for someone working a full-time minimum wage job to cover their basic needs. Earning the minimum wage does not ensure a livable income but having a fair minimum wage goes a long way towards helping low-income workers get by. Minimum wage workers are parents, caregivers, and community members. They include home health workers that support the independence of people with disabilities, preschool teachers who serve low-income students, and the cabin cleaners and baggage handlers that ensure our air travel runs smoothly. It is reprehensible that millions of people work full time, yet are a paycheck away from acute poverty and homelessness. Raising the minimum wage is a common sense step that would bring dignity back to the millions of employees that have been left behind. 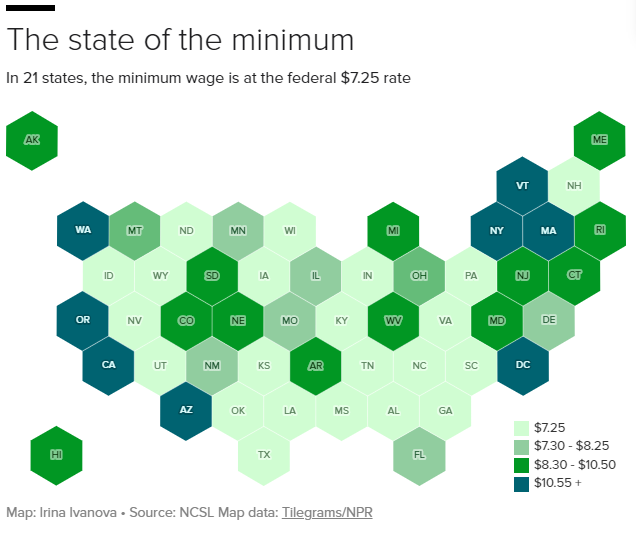 Since Congress has failed to increase the minimum wage, states have been leading the way. Twenty-nine states have raised their minimum wage; the 2018 midterm election brought about successful statewide minimum wage raises in both Missouri and Arkansas, with incremental increases to $12 and $11, respectively. Minimum wage increases in numerous and diverse states around the nation tell us that not only is it the right thing to do, but it makes good economic sense. The introduction of the Raise the Wage Act of 2019 is a top legislative priority for the 116th Congress and for NETWORK Lobby’s livable income policy initiatives. This legislation gradually increases the federal minimum wage to 15 dollars an hour by 2024. It also addresses the inflation issue by automatically raising the minimum wage based on subsequent increases in the typical worker’s wages. The bill also addresses inequities built-in to our current minimum wage by applying the same wage requirements for tipped workers and workers with disabilities. The Raise the Wage Act offers an impactful and targeted policy which would immediately help people and families living in poverty: 27% of beneficiaries are working parents with children and half have family incomes of less than $40,000 per year. While an incremental raise is not going to immediately fix the deep inequities low-wage workers have been dealing with for decades, it offers a much-need relief that will have an immediate impact on their quality of life. Even as we push for passage of the Raise the Wage Act of 2019, NETWORK continues to lay the foundation of pay justice for workers. Advocating a livable income for workers means promoting a broad array of policy changes in addition to increasing the minimum wage. A livable income would enable workers to accrue savings and assets, retirement security and protection against unemployment. What we consider “livable” allows workers to earn a disposable income, making possible leisure, educational and skills enhancement. A livable income incorporates opportunities for continued wage growth and promotion at a job. For the lowest wage earners in the country, the Raise the Wage Act would double their pay; potentially enabling them for the first time to afford safe and stable housing, sufficient amounts of food, adequate transportation, and reliable child care. Now is the time to put pressure on our representatives to do the morally responsible thing: raise the wage and provide a desperately needed economic safety net to the millions who have been left behind. This entry was posted in Emerging Justice Seekers, Front Page, Policy Update on January 22, 2019 by siena.